Publication can be found online here. This case study – prepared by TI Lithuania together with TI Secretariat and one of the three produced – focuses on Lithuania’s judiciary and aims to provide guidance to policy-makers and activists in a diverse range of countries for how specific data sets can used to prevent, detect and investigate corruption. All three case studies look at national chapter or regional initiatives carried out by the Transparency International movement. These initiatives have been designed to leverage open data sets as part of addressing corruption. As such, the studies do not assess the broader landscape of open data or how it has been used in other areas to promote change. 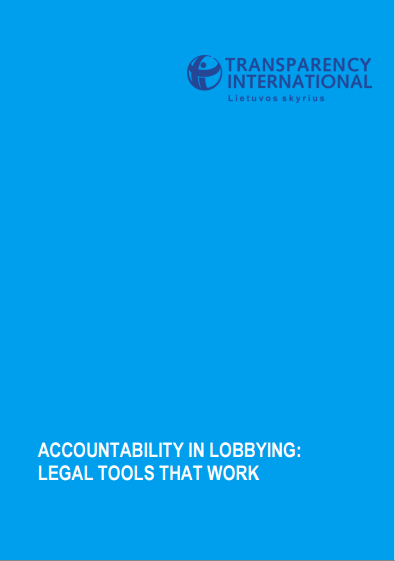 TI Lithuania together with the colleagues from the Global “Transparency International” movement conduct international practice analysis and recommendations on what would be the best ways to manage lobbying activity risks in different decision-making stages while using legal regulations. 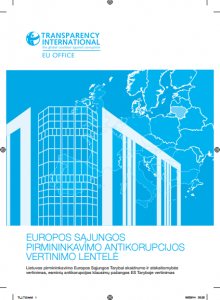 “Transparency International” EU Chapter together with TI Lithuania conducted evaluation on Lithuania’s presidency for the European Council in 2013. Research focuses on 6 spheres: public procurement, accountability of business companies, fight against money laundering, the establishment of common European Office of Prosecution, funding of political parties in the European Parliament, formation of association and trade agreements. It also evaluates information accessibility and budget transparency during the presidency period. This parallel implementation monitoring report analyses compliance of national legislation and the UN Convention Against Corruption. It focuses both on probable gaps in legal acts and also gaps in practice. The National Integrity Study includes the most important government institutions that are responsible for the fight against corruption. If these institutions function well, they create a strong and resistant NIS that can effectively fight corruption; conversely, if there are not enough essential rules and unreported behaviour is prevalent, perfect conditions form for corrupt behaviour and the disturbances in societal development and social cohesion. Due to this, reinforcing the NIS encourages a country’s development, better governance and the advancement of society. In order to ensure more effective management of public finances, more attention has to be devoted to the reasoning behind public procurement itself. During discussions about the effectiveness of management of public finances, several proposals were presented for new measures, such as public and private sector partnerships or creating ‘black lists’ of misbehaving suppliers. The aim of this publication is to discuss the merits and flaws of such initiatives and introduce Lithuanians to foreign practices. In addition, the practices of the European Court of Justice in the field of public procurement are presented. Tracking Corruption in Lithuania offers a snapshot of the anti-corruption research and transparency initiatives in Lithuania. The publication features a comparative analysis of the findings of the Lithuanian Map of Corruption, a sociological study which measured the perceptions and experience of corruption by the Lithuanian people. It also presents the results of a number of TI Lithuania private sector transparency initiatives, in the media, construction, and health care sectors. NGO transparency for beginners aims to introduce the representatives of NGOs to the developments, conditions and challenges relating to transparency in global and Lithuanian NGOs, as well as ways to solve arising problems. The book provides insights, guidelines and various documents to help NGOs function in a transparent and effective way, and help society understand what to expect from them. This book represents one of the first attempts to introduce Lithuanian readers to transparent and responsible business practices and the merits they hold. This book presents the best foreign examples about risk management and business ethics together with advice from experts. This book presents the unique sociological-criminological study carried out by TI Lithuania, revealing how Lithuanian businessmen perceive problems related to transparency in mass media. The publication includes commentary from various authors about the phenomenon of corruption in the media, and presents ways for citizens to recognize it when they see it. HOW TO MAKE PUBLIC PROCUREMENT MORE TRANSPARENT? This book presents the first sociological study of its kind on transparency in public procurement, together with the proportions of corruption therein, reasons for it and possible solutions. Furthermore, this publication includes the insights on corruption in public procurement from the Transparency International Czech and British experts. The book presents the guidelines on public procurement that were prepared by the Special Investigations Service (STT) of Lithuania. HOW MUCH TRANSPARENCY IS NECESSARY WHEN SPEDING EU MONEY? The book stresses that transparency is one of the most important aspects of EU structural funding. The publication includes texts that could inspire various anti-corruption initiatives and, at the same time, be used to help measure the effectiveness of such initiatives. LITHUANIAN MAP OF CORRUPTION 2001 – 2005 M.
The Lithuanian map of Corruption 2001 – 2005 consists of two parts: an analytic study called the Lithuanian Map of Corruption 2001 – 2004 and a compilation of the results of and insights on the latest Map of Corruption composed in 2005. Together, they offer the latest and the most detailed insights into the perceptions of and experiences with corruption of Lithuanian residents and business representatives. This book consists of results from three studies. It analyzes the experiences relating to bribery cases of Lithuanian residents and business representatives. 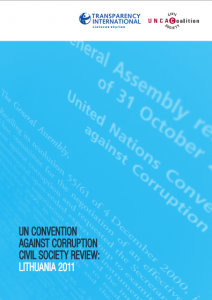 It further presents an analysis of the levels of corruption and its impact on society, together with a study of the public opinion with regard to various anti-corruption measures. The four NGOs that make up the civic alliance against corruption provide advice to the government and society at large on how to curb corruption in Lithuania. This book aims to encourage politicians, law enforcement agencies, and society itself to focus their attentions on three main priorities for anti-corruption activities. HOW TRANSPARENTLY DO WE SPEND EU MONEY? 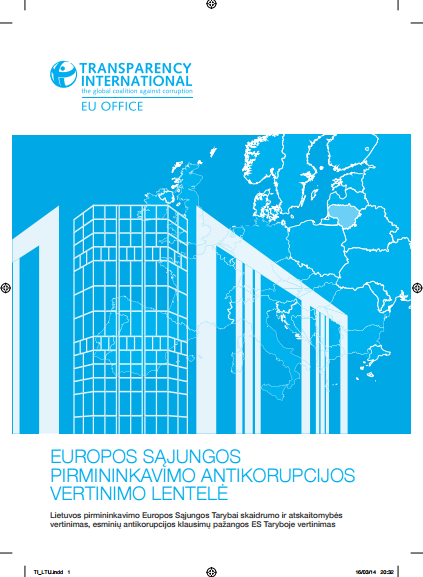 In this booklet, experts on the subject of EU structural funding analyze how transparently this funding is utilized in Lithuania based on the data available from the 2004-2006 period. The main insights relate to the administrative system, which creates the risk of politicization in project selection. Experts present their recommendations to help reduce this risk, to ensure that the evaluation of submitted applications is performed properly and impartially, and to help make the valuation process more transparent and public. This book presents the reasons for corruption in the municipal government and considers the opportunities to fight it. Corruption in the municipalities is supported by their inability to reform certain sensitive areas: licencing procedures, protectionism in the workplace, procedures for appealing administrative decisions, possible conflicts of interest. This book presents tools to help determine corruption risks and their main causes. The authors of the book provide the reader with concrete examples of how to fight corruption by engaging the public in the process. This book presents research articles from twelve authors (Lithuanian and foreign lecturers, professors, bankers, experts from independent agencies and media representatives) about phenomenon of corruption in politics, state institutions, the media and the economy. The authors address the most pressing questions of transparent management. This book reviews the concept of corruption, its current state, threats and harm caused. The book analyzes the legal framework established to prevent corruption, summarizes the anti-corruption initiatives of the Lithuanian government, examines the work of institutions responsible for controlling and legally prosecuting corruption and reviews the input of the media and society. One the founders of Transparency International, Peter Eigen, discusses the causes of corruption, its scale and consequences for the whole world in depth. The book presents the story of how Transparency International was established and what it had been doing, which can be seen as a great example of how to successfully engage civic society. *You can find all of the above publications and many more in our office library, located at Didžioji st. 5 – 402, Vilnius. You can arrange the visit through info@transparency.lt, during the weekdays from 9:00 to 18:00.